To have taken so long to feature Euphorbia mellifera in my regular Flower Candy spot is an unforgivable oversight. Perhaps it’s because the flowers produced by this statuesque Canary Islands shrub are curious rather than pretty. They emit an intense, heady, honeyed scent, which gives rise to the species name ‘mellifera‘, derived from the Latin word for honey, mellis. 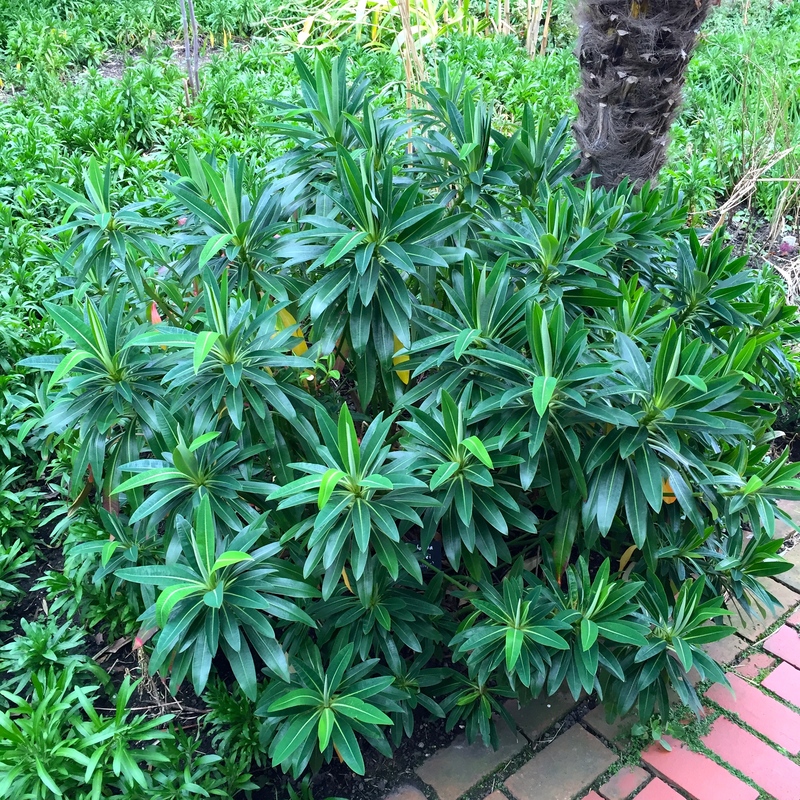 Euphorbia mellifera is an adaptable, easy-going and attractive plant. I have grown it for at least 15 years in gardens in Cornwall, London and Broadstairs where in each location it has behaved differently. In Cornwall, planted in an exposed, sunny position my original, teenage plant remains waist high and perfectly domed, so neat it might have been pruned that way. The leaves are a pale, apple-green. In contrast, grown in a sheltered spot in London and bathed in sun for only a few hours each day, E. mellifera grows lush and tall, lending it an exotic air, which is how I enjoy it best. A 12″ high seedling planted three summers ago is already 8′ tall and counting (see below). The evergreen foliage is a luminous, waxy, pea-green, which alone is enough for me, but in spring appear the clusters of scented brick-red flowers that lend the plant its name. 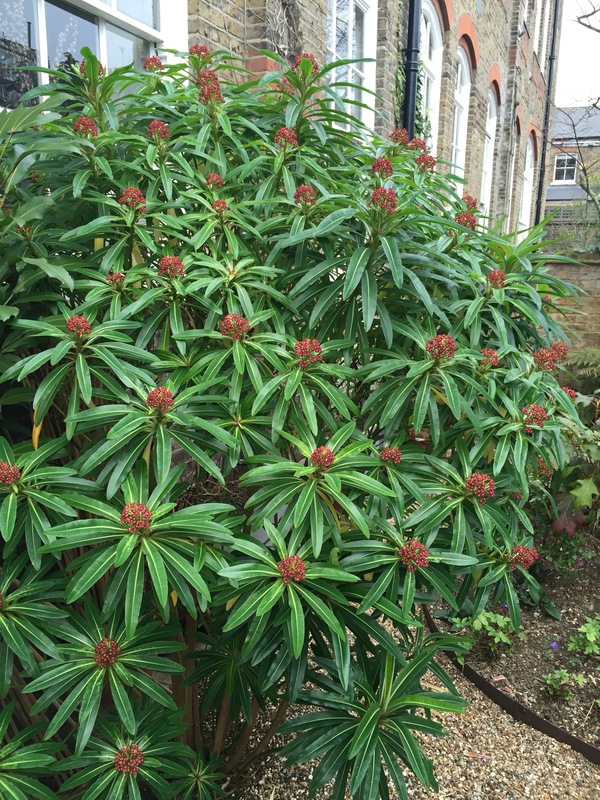 After a strong start, our garden in Broadstairs became too shady for this lovely spurge. After a ‘restorative’ prune to 6″ above the ground it never came back satisfactorily and I eventually grubbed it out, which took the best part of a day. Euphorbia mellifera makes a big plant and hates disturbance. Alas E. mellifera is not a candidate for a pot unless, perhaps, an exceptionally large one. I have had many a seedling appear in a container but they have never prospered as they have grown on, probably because they enjoy a long root run through a well-drained soil. As with all euphorbias, this plant contains a milky-white irritant sap which oozes out of the stems when cut. This may lead to painful rashes on the skin and can be very harmful to one’s eyes. Gloves should be worn when pruning and pulling off old leaves, otherwise there should be no cause for alarm. I’ve always been more than satisfied with E. mellifera, but this year I have planted the seed of a new introduction to gardens, Euphorbia x pasteurii. This new spurge was created by crossing E. mellifera with the incredibly rare E. stygiana which is now almost extinct in its natural habitat in the Azores, where only 50 mature plants remain. The cross has created a very fine plant with a more compact habit than E. mellifera and wider, deeper green leaves akin to a rhododendron. Flowers are produced from April to June, earlier after a mild winter, and are honey scented like both parents. Seeds of all three species mentioned can be sown at any time of the year on a standard seed compost in a cool greenhouse. Germination may be sporadic so a little patience is required. Good things come to those who wait. Once your seedlings are big enough to fend for themselves plant them into their final position in the garden (most soils are acceptable), stand back and watch them grow into fine architectural specimens. Seeds of E. mellifera, E. x pasteurii, E. stygiana and many other euphorbias are available from Plant World Seeds. *AGM denotes the RHS Award of Garden Merit which is bestowed upon only the most garden-worthy plants. My pleasure. Happy Easter Candy! 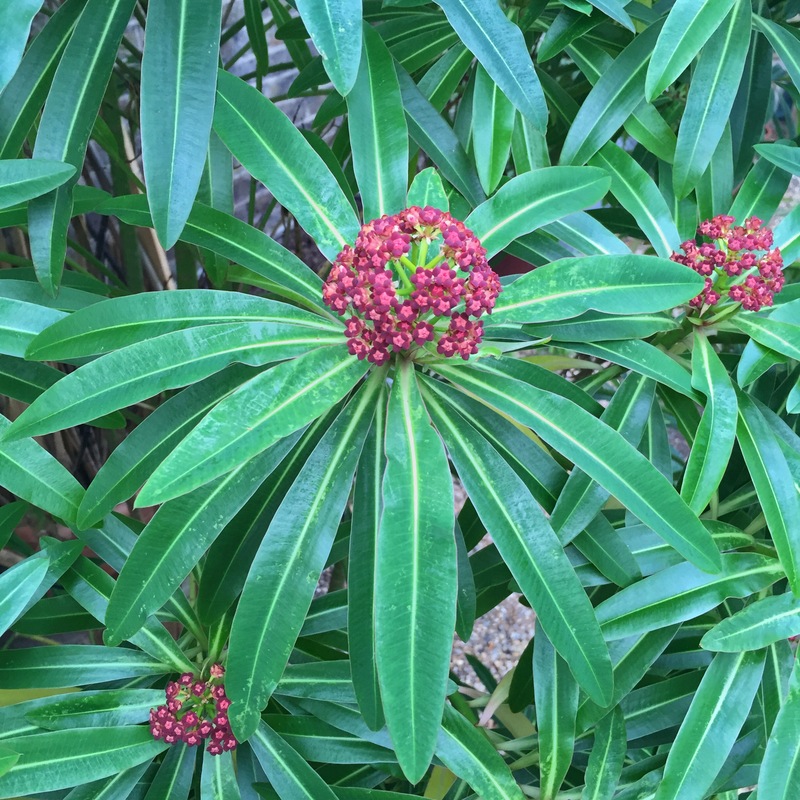 Euphorbias are one of my favourite families of plants, so I really enjoyed this post, thank you. What a fine specimen of mellifera. Any tips for stopping the taller ones getting leggy as they age? I’d suggest growing in the brightest spot available first and foremost, but if they do get too big or too leggy they can be chopped down to 6 or 12 inches above ground without causing any harm. This probably needs doing every 3-4 years to keep a good shape. They are beautiful but a bit too tender for my Worcestershire garden with no shelter unfortunately! Lovely photos Dan, and a happy Easter to you and HI..! Thanks Anne, to you too! This Tuesday just gone, the Abbey Gardens on Tresco had many mellifera, all in bloom with the most wonderful perfume. Of course these gardens also have far too many plants to mention flowering “out of season” or “early”. some of which I could name but many I had not seen before. I was also taken aback by coming face to face with one of the Chinese pheasants who live in the gardens – surely the most exotic looking bird to be found in the British Isles. On Bryher, at the side of lanes, geranium maderense were flowering away. Enjoy your trip to Cornwall. Mrs. P.
Euphorbia stygiana itself isn’t that rare. The ‘tree form’; subsp santamaria is down to just one stand. It has not been in UK cultivation for long, but Mark Fillan at Tuckermarsh Plants now has a fruiting adult, so seedlings are available. If you want a tree form of course! Thanks for letting me know Chad. And for the helpful detail. The bigger the better as far as I am concerned! For me, the jury is still out on exactly how big ‘john phillips’ will get as ive seen internet pictures of it at about 6 foot and just as big as mellifera (and i read more vigorous too). I got mine from edulis but was surprised to find the salutation are infact selling seedlings of john phillips and not the real thing! After that, i have some doubts whether the one in the salutation garden is really jp as it doesnt seem to have particularly long leaves and looks more like mellifera. Well, I think you are possibly more expert in this than I am Tim, so I will take your word for it. I now have E. stygiana growing in Broadstairs, E. mellifera in London (seeds everywhere) and seedlings of E.x pasteurii in the dining room. They are germinating very sporadically, but I really only need one plant and the rest I will give away when they are large enough. Thanks for this great post. What’s your personal experience with E. mellifera’s cold hardiness – or lack thereof? What’s the lowest temperatures your plants have survived, and how were they affected? Thanks in advance! 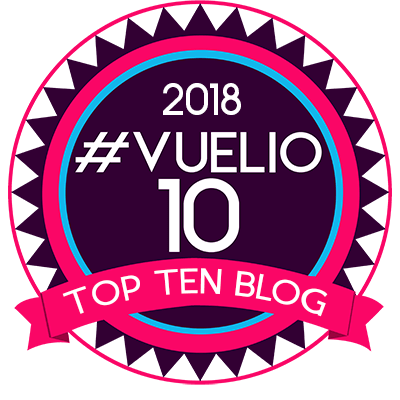 Hello, So glad to have found your most excellent blog this rainy February morning. I have E. mellifera growing 15′ tall and use them as nurse trees to grow more tender plants beneath. It reseeds and grows in a small forest that is easy to control in size. I prune them up and let them dome out at the top. They withstand light frosts that I get up here at 40°N far northern California coast without any problems and are great for protecting young palms and ferns till they establish..
How interesting! I’ve never seen one grow that tall here in the UK, but then our climate is probably a touch cooler than yours overall. Must be an impressive sight. My sister has an E. mellifera in her garden which I must have planted 15 years ago and it’s still a perfect hummock about 5ft tall and around. It’s one of those plants that seems to adapt its habit to the situation.